For effective care of your cold, cough & flu symptoms, you want symptom relief you can trust so that you can get back to normal… whatever your normal is. Trust the effective relief of Tylenol Complete Cold, Cough & Flu products for your cold & flu symptoms. 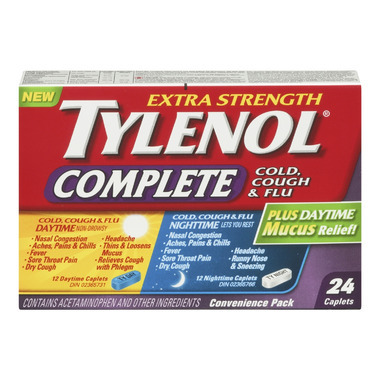 Tylenol Complete Cold, Cough & Flu caplets give you the trusted relief you need. Dosage: Adult Use Only (12 years and older): Take 2 Daytime OR Nighttime caplets every 6 hours. Do not exceed a combined total of any 8 Daytime or Nighttime caplets in 24 hours. Non-Medicinal Ingredients (alphabetical): Cellulose, croscarmelose sodium, D&C Yellow No. 10 Aluminum Lake, FD&C Blue No. 1 Aluminum Lake, hypromellose, polyethylene glycol, polysorbate, polyvinyl pyrrolidone, propylene glycol, silica, silicon dioxide, starch, stearic acid, titanium dioxide, wax, zinc stearate. Caution: Read the complete label before use and follow all directions. DO NOT USE with other products containing any of these ingredients, salicylates or other cough/cold or pain/fever medications. Keep out of reach of children. This package contains enough medication to seriously harm a child. Do not take more than the recommended dose. Overdose may cause nervousness, dizziness, sleeplessness or severe or possibly fatal liver damage. Consult a healthcare practitioner before use with other medications, including natural health products, prescription drugs, nonprescription drugs or if you have chronic alcoholism, serious kidney or liver disease, high blood pressure, heart or thyroid disease, diabetes, chronic lung disease, shortness of breath, asthma, glaucoma, an enlarged prostate or are elderly, pregnant, or breastfeeding. Do not use with a monoamine oxidase inhibitor (MAOI, e.g. drug for depression) or for 2 weeks after stopping the MAOI. Persistent cough may be a sign of a serious condition. Use only on the advice of a doctor. Consult a healthcare practitioner if fever lasts more than 3 days, sore throat pain lasts more than 2 days, or symptoms last more than 5 days. If symptoms worsen, or are accompanied by a high fever (>38˚C) or the production of thick yellow/green phlegm, talk to a doctor. Do not use if allergic to any of the ingredients. Discontinue use if allergic reactions such as wheezing, rash or itching develop. TYLENOL® Complete Cold, Cough & Flu Nighttime: Avoid alcohol. May cause drowsiness or excitability. Do not engage in activities requiring alertness. In Case of Overdose: contact a doctor or Poison Control Centre immediately even if you do not notice any possible signs or symptoms such as increased sweating, nausea, vomiting, stomach pain, and loss of appetite. Security Feature: Do not use if a blister unit is broken. Store between 15-30°C. Protect from light. Keep dry.